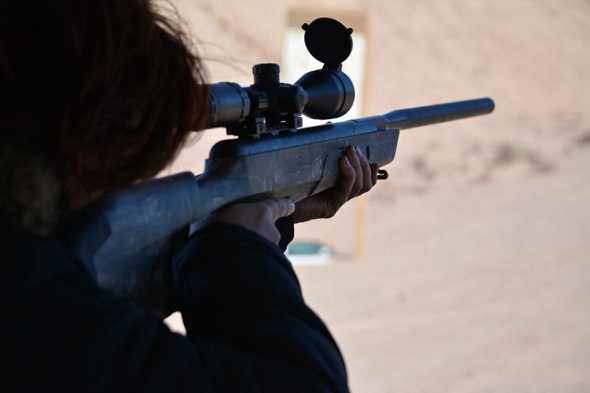 I had the opportunity to try Crosman’s newest air rifle at SHOT Show Media Day at the Range. It’s a break open, .22 caliber rifle so more speed yet an easier cocking mechanism. The new piston system provides 15% more velocity and 35% more power, but with 10 pounds less force required for cocking. Shooting it? Since energy is stored with a gas system and not a spring, it shoots like a dream. No sproinggggg! Stay tuned, we’re working on a head to head test of this rifle against a .22 Long Rifle rimfire. Given the advances in air rifle power and velocity, the results should be interesting. I already know one benefit: you can shoot it in most any back yard. I have a Benjamin Trail NP, and I have to say that I absolutely love it! I’ll be curious to see how it stacks up against the .22 long rifle.